For the Texel Guinea PIg, very curly and long hair is the order of the day! Texel Guinea Pigs have some of the most gorgeous tresses in the animal kingdom. Their curls have won over many a judge at competitions! The Texel is arguably one of the most beautiful breeds of Guinea pig. Their unique look has the power to win hearts in a flash. Their friendly and curious personalities are equally admirable, making the Texel a great Guinea pig for a pet or for show. The biggest concern when keeping a Texel Guinea Pig as a pet is grooming. All of that luxurious, curly hair requires a substantial amount of work to maintain. Therefore the Texel is not recommended for children, or for adults who do not have a lot of time to dedicate to it. The Texel Guinia Pig is one of the newest guinea pig breeds. It originated in England around 1980, with the crossing of a Rex and a Silkie. Many crosses and several years later, the Texel developed into what it is today. It was later introduced to the United States, and became recognized by the ACBA in 1998. 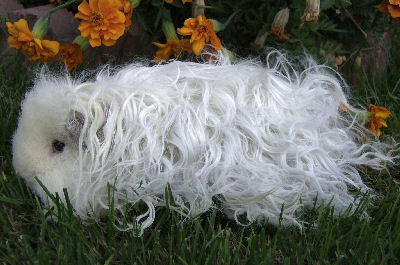 The Texel Guinea Pig is similar to a Silkie Guinea Pig, but instead of straight hair, it has curls. The entire body is covered with hair, and it sometimes has a natural part in the center of the back. The face has shorter hair, and there may or may not be longer curls below the ears and lower jawline. The Texel has a short body with a broad, round head. Texel's are sometimes found in Satin, which is a coat that is denser and shinier than the regular Texel coat. Satin Texel's are not yet recognized by the ACBA. The Texel Guinia Pig comes in a variety of colors and patterns. Any of these are acceptable for show purposes. Texel Guinea Pigs are readily available from breeders in many areas. If you can't find any locally, you may be able to locate one online. Prices are usually between $30 and $40. This is the cutest hamster that I have EVER seen! I think they are always cute and so funny. hey im looking for a guinea pig like this one would anyone know?.....and if you think thats a hampster then you have seen some very large hampsters:)and very furry ones at that!